Size of Male: 50-60 lbs., 19-21 in. Size of Female: 40-55 lbs., 18-20 in. The sturdy and versatile Norwegian Elkhound is an old breed from Scandinavia. They were a hunting and guard dog for the Vikings, able to track and hold game such as bear and moose for the hunter. Today, this is a very friendly, independent dog breed. They are exceptionally loyal and usually bond very closely to their families. There is some speculation that this dog breed dates back more than six thousand years but recent DNA evidence has shown that this breed is not quite that old. However, they are a very old breed and dogs of this type were kept by Norsemen in Viking times to guard homes and hunt moose, elk and bear. Although classified as a hound by many registries they are not actually a hound in any real sense. They are more akin to northern spitz-type dogs. 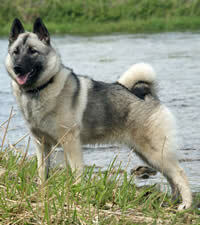 The Elkhound is usually a very friendly dog but they are also dignified and independent. They are extremely loyal to their families and very people-oriented. They are usually gentle and very good with children. They are considered above average in intelligence. They can make a good watchdog. Living Environment – These dogs are very active and they generally do best if they have regular access to open spaces. They are very hardy and originated in a cold climate so they enjoy spending time outdoors in winter. They enjoy playing in snow. Grooming – Although their outer coat sheds most dirt and debris, this dog breed does require regular daily brushing. They do shed a great deal and will have two large coat blowouts each year. Diet & Exercise – The Elkhound has normal dietary requirements but they need a great deal of daily exercise. If their exercise needs aren’t met they can become destructive in the home, chewing things and tearing things up. Elkhounds have tremendous stamina so they need lots of exercise to stay fit. They can become overweight if you feed them too much, especially if they don’t get enough exercise. Health – The Elkhound is considered a reasonably healthy breed but they can suffer from progressive retinal atrophy, canine hip dysplasia, renal problems, and thyroid issues. You should always talk to a breeder about health issues before getting a puppy. When it comes to dog training, the Norwegian Elkhound is considered to be above average in intelligence but they can be very independent-minded. For this reason you may have to work extra hard on training an Elkhound. They can be very good at agility and tracking, in particular, if you find ways to motivate them and if you’re persistent with your training.